WATERLOO – Wilfrid Laurier University’s Edna Staebler Award for Creative Non-Fiction will celebrate its 25th anniversary Nov. 3 and 4 with special events at the university’s Waterloo and Brantford campuses and at the Princess Twin Cinema in Waterloo. 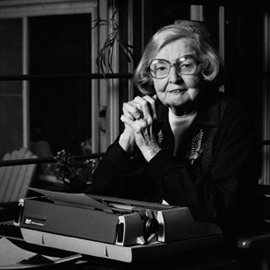 The Edna Staebler Award for Creative Non-Fiction was established and endowed by writer and award-winning journalist Edna Staebler in 1991. The $10,000 award encourages and recognizes Canadian writers for a first or second work of creative non-fiction that includes a Canadian locale and/or significance. The winner of the 2016 Edna Staebler Award for Creative Non-Fiction is The Prison Book Club by Ann Walmsley (Viking). The shortlist for the 2016 Edna Staebler Award included: That Lonely Section of Hell by Lorimer Shenher (Greystone) and The Right to be Cold by Sheila Watt-Cloutier (Allen Lane). Nov. 3, 1 p.m. to 2:30 p.m.: A public award presentation and reception for this year's winner, Ann Walmsley, will be held in the Laurier Library on the Waterloo campus. Nov. 3, 7 p.m. to 9 p.m.: Renowned writer, editor and publisher Douglas Gibson will discuss creative non-fiction with past winners of the Edna Staebler Award for Creative Non-Fiction, including Wayson Choy and Lynn Thomson, at a public event at the Princess Twin Cinemas in Waterloo. Tickets are $10 for general admission; $5 for students. Purchase tickets to this event. Nov. 4, 11 a.m. to 1 p.m.: Ann Walmsley will be speaking to students, staff and faculty at a public event on Laurier’s Brantford campus at the Carnegie Building. Find out more about this event. Find more information about the Edna Staebler Award for Creative Non-Fiction.